​Cole Porter romanticized the phrase in his 1936 song, but the probable origin of having someone — or something — under one’s skin is much less pleasant to consider. An early usage of the phrase by author Bayard Taylor in 1864 illustrates: “The idea was like a tropical sand-flea. It had got under my skin, and the attempt to dislodge it opened the germs of hundreds of others.” Today, in some water bodies, the possibility of going in for a swim and coming out with a disease-causing parasite lodged under the skin remains all too real. ​One such parasite is the flatworm belonging to the genus Schistosoma, commonly known as a blood-fluke. The flatworm is responsible for schistosomiasis, a disease that occurs in areas with poor sanitation where humans can come into contact with freshwater contaminated with the parasite. Schistosomiasis causes a range of symptoms including anemia, stunted growth, malnutrition, fibrosis, kidney failure, gastrointestinal illness and lesions to the central nervous system. The Centers for Disease Control and Prevention says that in terms of impact of parasitic diseases, schistosomiasis is second only to malaria and is the most deadly of the neglected tropical diseases. More than 700 million people, mostly Africans, live in areas where the disease is endemic. Around 240 million people are infected with schistosomiasis and more than 200,000 die from it every year. A WALL AGAINST THE NEXT SANDY: WHERE SHOULD IT GO? Full story at The Brooklyn Ink, and find more Brooklyn stories here. The brackish channel at the convergence of the East River and Upper New York Bay separates Red Hook from the Financial District at the southern tip of Manhattan. 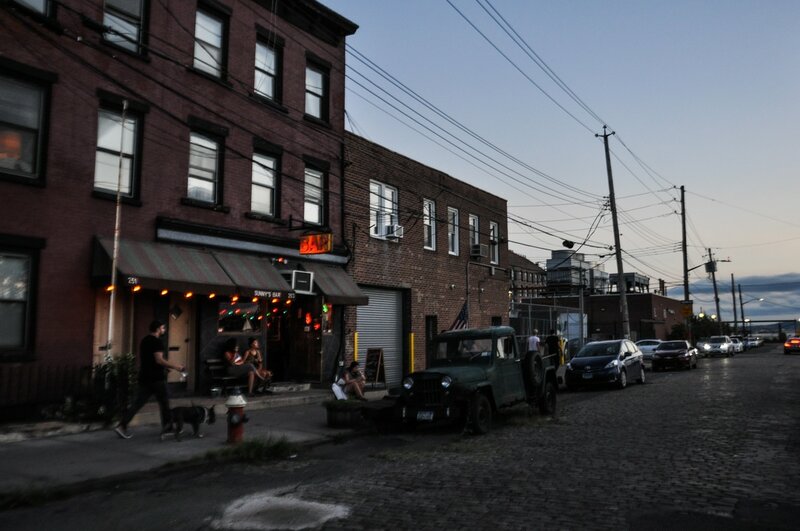 Take the twenty-minute ferry between the two neighborhoods and you’ll see just about all of Red Hook’s several miles of waterfront. Hugging the coast are recreation areas, small businesses, an IKEA, a Fairway, a cruise ship terminal, warehouses, and other industrial sites. When Hurricane Sandy ripped ashore nearly four years ago, in late October 2012, most of these sites flooded. More than half of Red Hook is below 10 feet in elevation, and it was one of the hardest-hit neighborhoods in New York City during the storm. The timing of the storm—with high tide—caused even more water to surge into the streets, homes, and businesses of Red Hook. Full multimedia story on Medium. ​Most extreme climate and weather events involve an unwanted surplus — too much rain, too much wind or too much snow and ice. 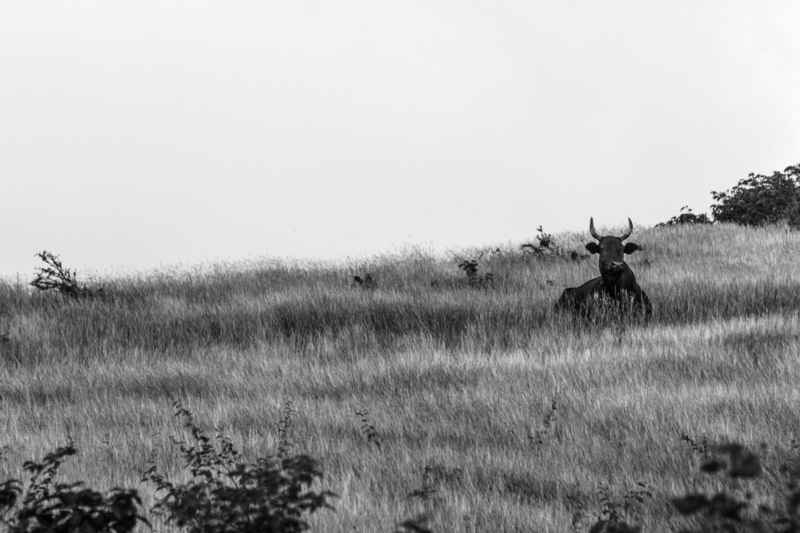 Drought is a little different: it’s the absence of something. It takes time for a drought to build, making it fundamentally different to monitor or forecast than many climate and weather events. 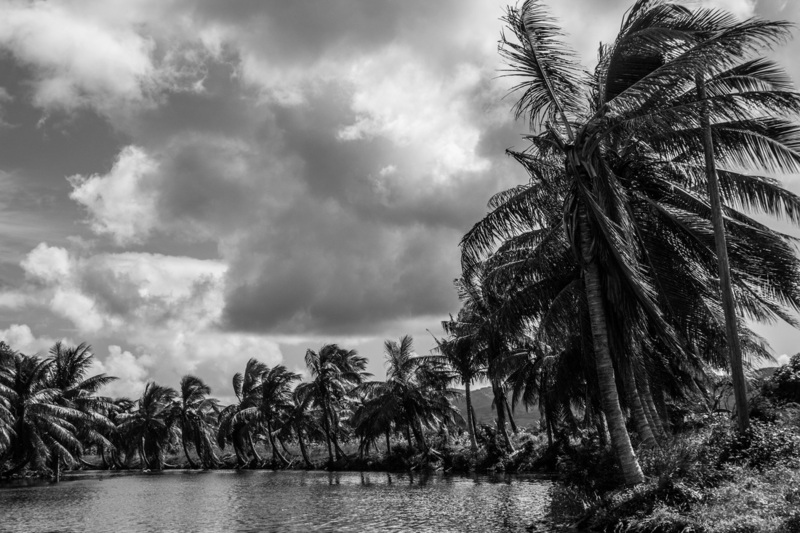 In the Caribbean, much of the interaction between forecasters and decision makers has revolved around the wet season events— especially hurricanes and floods. 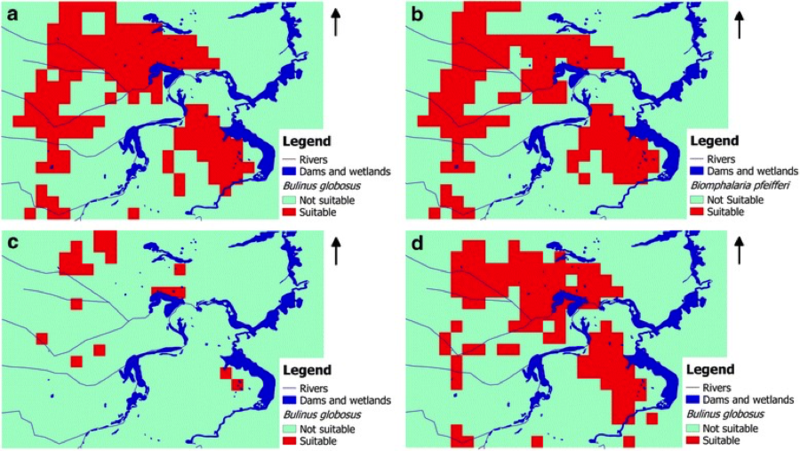 These short, high impact events deserve this attention, but scientists and decision makers have also started working together to develop useful information about other kinds of climate impacts, namely drought. In an effort to improve drought forecasts and their use by stakeholders, the first dry season Caribbean Climate Outlook Forum (CariCOF) took place in St. John’s, Antigua in December 2014. CariCOF is one of many regional COFs around the world that bring together climatologists, meteorologists, and the people who might use the information they produce (e.g. representatives from health, agriculture, water management, etc.). WHY ARE HURRICANES SO HARD TO TRACK? ﻿Full story on The Daily Beast. 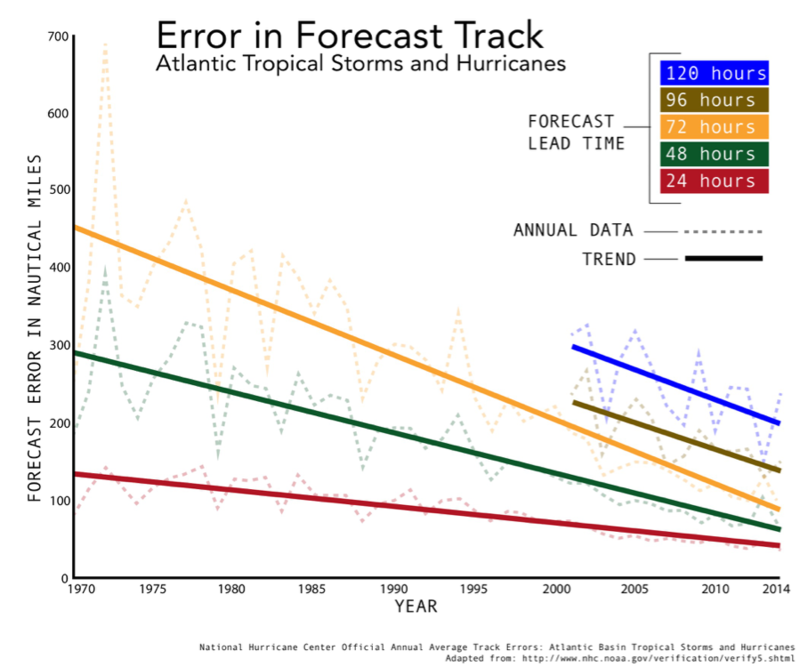 Hurricane Joaquin has been yet another example of the complexity of predicting a hurricane’s path and strength. Lives, livelihoods, and wider economic costs make such forecasting a high-stakes endeavor, but hurricanes remain harder to predict than the land-based weather systems that track across continents producing rain, snow, wind, and severe weather. While both systems consist of spinning centers of low pressure, according to the Kerry Emanuel, professor of atmospheric science at the Massachusetts Institute of Technology, hurricanes and land-based systems “have completely different physics.” Evaporation of ocean water fuels hurricanes, while land-based low-pressure systems are driven by horizontal temperature changes over land. The strong winds and heavy rains of a hurricane cover a path that is usually 100 miles or so across, and they can change in less than a day; ordinary low-pressure systems can be thousands of miles across and only change over several days, said Emanuel. Sea surface temperature anomalies during El Niño, November 2015. From the IRI Data Library: http://iridl.ldeo.columbia.edu. 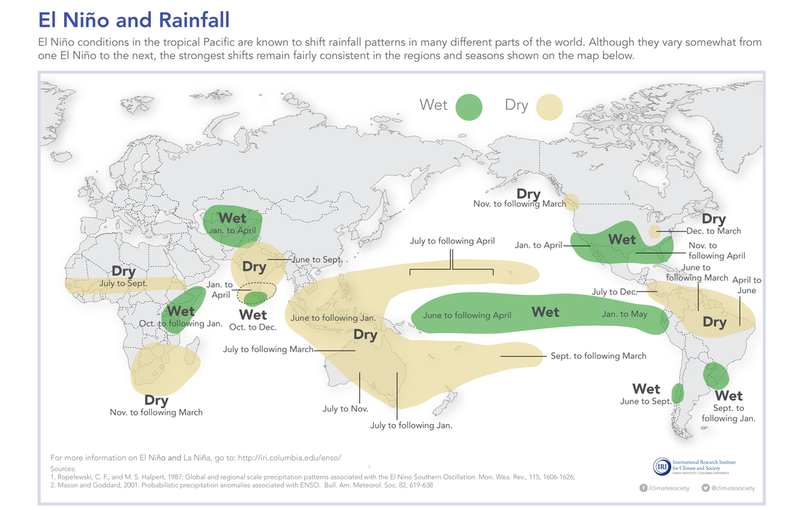 Typical El Niño rainfall patterns, from the IRI Data Library (http://bit.ly/ElNinoRainfall). Full story on The Daily Beast. When you hear about El Niño, perhaps you first think of Chris Farley. Or maybe you lived in Southern California in 1997, so you remember the storms, floods, and mudslides. 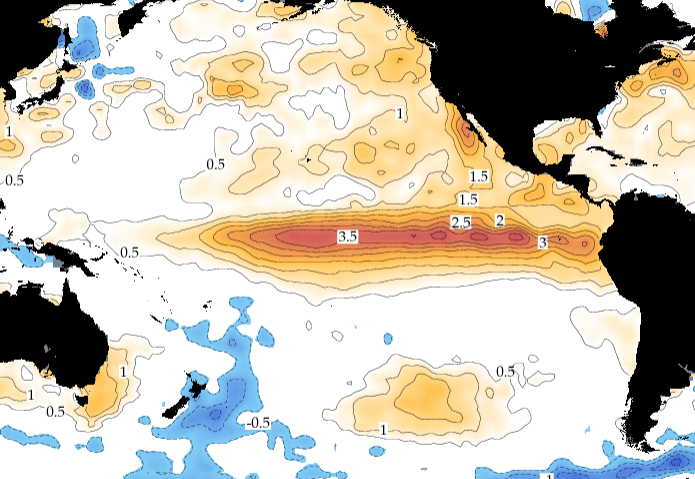 If you’re a scientist, you might think of that remote section of the equatorial Pacific where higher-than-normal sea surface temperatures define El Niño and influence climate and weather around the globe. Or (just maybe!) you think of my El Niño article from the spring (check it out for more background on the science of El Niño). But you my not know of the myriad other impacts El Niño can have around the world. Some of them can actually be positive, like better growing conditions for agriculture in Uruguay. But many are negative, and some are less directly obvious. Drought and food insecurity in Cambodia. Rift valley fever in Somalia. Fishery collapse in Peru. Malaria transmission in Colombia, eastern Africa, and other areas. So how does El Niño exert this broad influence? Some refer to El Niño as a storm, but that’s not quite accurate. The conditions of the ocean and atmosphere in the equatorial Pacific operate on a natural cycle, known as El Niño Southern Oscillation (ENSO). When the cycle swings to one extreme or the other—i.e., sea surface temperatures being much cooler (La Niña) or warmer (El Niño) than normal—it can set in motion a series of cascading atmospheric effects. There are typical patterns of this cascade, which do tend to lead to more storms in some places (like the west coast of South America and Southern California), but also to less rainfall in other places (like Indonesia and Australia). Temperature patterns are similarly affected. The top image shows the precipitation anomalies from Nov 2015 – Jan 2016 (mm/season). The bottom shows precipitation anomalies for Jan 2016 only (mm/month). The anomalies are compared to the 1971-2000 base period. The peak of the ongoing El Niño occurred in November 2015, but the event remains in “strong” category, and is likely to stay at moderate strength through April. The El Niño signal is still tipping the odds for certain climate impacts in some regions for the next several months (see seasonal forecasts near end of post). This El Niño has been unique from past strong El Niño events both in its climate features in the Pacific as well as in the way its impacts have manifested around the world, said Anthony Barnston, IRI’s Chief Forecaster. In the Pacific, sea-surface temperatures in the Nino3.4 region, which officially define the El Niño event, have been similar to those in the strong 1982-83 and 1997-98 events. The temperature pattern in the surrounding waters, however, has been a little different. In the western Pacific, temperatures during an El Niño are often cooler than average, but this year they have overall been more average. Additionally, the warm surface waters in the central equatorial Pacific typically extend to the eastern side of the basin, approaching the South American coast. During this event, waters in that part of the ocean were well above average during the Northern Hemisphere fall, but have since become only somewhat above average.